There were more than 7 Million visits to www.geogebra.org in 2011; this compares to 5 million in 2010. The visitors came from 226 countries and territories. 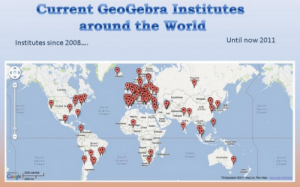 There are currently 85 GeoGebra Institutes around the world, so this great piece of software truly has international support. Users clicked on the download links (from www.geogebra.org alone) 5,930,008 times. Please visit and share these pages to discover the best GeoGebra materials and coolest math-loving people! This information comes from the GeoGebra Year 2011 Report. You may read the entire report online there.